The rise of mobile adoption has driven companies to invest enormous capital and resources into pursuing the best possible mobile experience for their end users. After all, satisfied mobile users behave in ways that support core business objectives – they browse more pages, transact more frequently, and spend more time and money. As stakeholders across the business have a vested interest in overcoming mobile delivery challenges, how do these teams come up with a unified solution? What should they focus on? 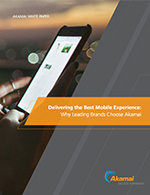 This paper discusses the challenges in delivering the best mobile experience and how Akamai can help businesses overcome them.